Two words have become mantras in the post-election babble: ‘fear’ and ‘aspiration’, sometimes counterposed to ‘hope’ and ‘equality’ respectively. It would be useful critically to scrutinise both of them. We need to think precisely in the coming months with a language that helps us express what we are really about. There was certainly a lot of fear being spread during the election. And what happened in the final days was that the Tories mobilised the fear that many people feel and directed it at Labour and its possible alliance with the SNP. An atmosphere of fear reinforces an underlying desire for order and antipathy to change. It induces paralysis. Its opposite though is not hope; it is self-confidence, especially collective self-confidence. Hope is important but unless it is combined with self-confidence and a sense of one’s own power with others, to take effective action, it can also be passive. Look at the movement for Barack Obama in 2008. Hope was its theme but it was hope in someone else, for change on our behalf. It made many people feel good and encouraged a few to act for themselves hoping that Obama would support them. For example, workers in Chicago occupied their factory to save jobs, urging Obama to intervene. But in general Obama’s campaign and action in government did not build the self-confidence to take collective action and failed to achieve what it promised as a result. Another case not only of passivity but of being relaxed about the inequality that the capitalist market inevitably produces. But then we all know from Mandelson’s infamous statement about being ‘intensely relaxed’ about some people being ‘filthy rich’ that is exactly what he and it seems most of the contenders for the Labour leadership want. An active, self-confident labour movement is what they spent their lives trying to crush and partially succeeding. With Cameron’s victory we are going to face an attempt to complete Thatcher’s agenda of destroying the unions and dismantling the welfare state. Make no under-estimation: we will see a concerted attack, as aggressive as Thatcher if not more so, on collective rights and social gains won through an entirely opposite understanding of aspiration: aspiration through social and collective action, aspiration for a class or oppressed community. In this social sense, aspiration is exactly what the trade union movement, so maligned by the very same political vultures, is all about. It’s an idea that goes back to Marx: ‘the free development of each is the condition for the free development of all’. You can trace it through William Morris’s emphasis on individual self-realisation through community, to the women’s liberation movement, which exemplified movements for personal liberation through collective action and solidarity. We knew that only through a powerful social movement in alliance with others could the deep structural inequalities that blocked women’s aspirations be eliminated. Essential to the character and success of that movement was the emphasis on building self-confidence and networks of mutual support, enabling people to act politically as they coped privately with the everyday trials of being a woman. Even more so now: the protests that were so quick off the mark after the fright of Friday 8 May are expressions of a struggle to survive. Refusal is becoming a matter of necessity. The case of the seven women school students who organised an unexpectedly large post-election protest in Bristol is exemplary. This combination of a sense of injustice with a sense of illegitimate exclusion and silencing plus a strong sense of personal responsibility is the perfect recipe for direct action. And we will see more it at every level: from a spread of occupations of houses by communities saving their homes from social cleansing and property profiteering, to the militant organising of groups of precarious workers like the hotel workers Unite branch, encouraging waiters to refuse bullying by getting organised. The idea of ‘building each other’ is spreading fast. ‘We didn’t think this would become as huge as it has,’ says Megan about Bristol Against Austerity. ‘There have been protests in Cardiff, Sheffield and one due to take place in Glasgow. The national media don’t report them – we only found out through Twitter.’ She ends her list with the big demonstration in London on 20 June. A process of making connections has also been quick to get underway, helped by techno-tools but driven by indignation and determination. A Radical Assembly called one week after the election in London attracted over 1,000 activists involved in direct action from which people gained confidence to step up their militancy and strengthen their alliances. We can look to Scotland for inspiration, for the possibility and the know-how of building an interconnected movement that works through good communication and common ideas rather than a centralised organisation. The Radical Independence Campaign provides an impressive example of an aspirational movement – in the social labour movement sense that Mandelson et al would not recognise and of which Miliband, with his deference to the Westminster state, was ignorant. He’s not alone. And although with Cameron in office there is probably little that he and his fellow SNP activists can achieve through sitting in Westminster and sticking to conventional procedure, there is much that a progressive anti-austerity alliance of MPs, including from Plaid Cymru, the Labour left and the victorious Green Caroline Lucas, can contribute to amplify the voices and demands of the movement across the country. The presence of the SNP, along with the fact of having a government voted for by only 24 per cent of the electorate, reminds us of the urgency of democracy and the broken nature of our unwritten, pro-elite constitution. This points to the need, alongside the actions against austerity, to campaign for an open constitutional process for the whole of the UK, including the English cities and regions, to develop a constitution that radically redefines politics, basing it on popular participation in its making and in its final character. The Tories are already fusing destruction of the welfare state and further privatisation with ‘devolution’ to city regions, starting with Manchester. We need to respond with a clear political alternative rooted in the needs of the people. Here we can also learn from Podemos, which is urging a similar process in response to the crisis of the Spanish state and the demand for Catalan self-determination. Collaboration with Podemos and Syriza especially, with their large circles here in the UK, is vital to the movement we need to create. This leads us to the unavoidable issue of the EU referendum. I watched Cameron celebrate his victory on a friend’s TV in Athens, a late-night conversation with Syriza members ringing in my ears. They were stressing the concertedly political nature of the conditions that the EU was imposing on Syriza: a neoliberal determination to crush a political challenge that might spread. Cameron and Osborne have an entirely common cause with this EU. The referendum has been mainly Tory damage limitation against UKIP. Refusing their cynical choices ‘yes’ or ‘no’ – a neoliberal super-state or a xenophobic little England – we must turn the referendum into a platform for working on a practical strategy for another Europe. This should include tours of Podemos and Syriza activists engaged in the kinds of struggles – for example, against eviction or building a solidarity food movement – that the mass of people face here. There is so much to be done beyond the ballot box. And the signs are that Labour Party members are waking up to this too. There is much talk of ‘a movement’, a turning away from the leadership elections, making links across branches to promote debate and support for local struggles. 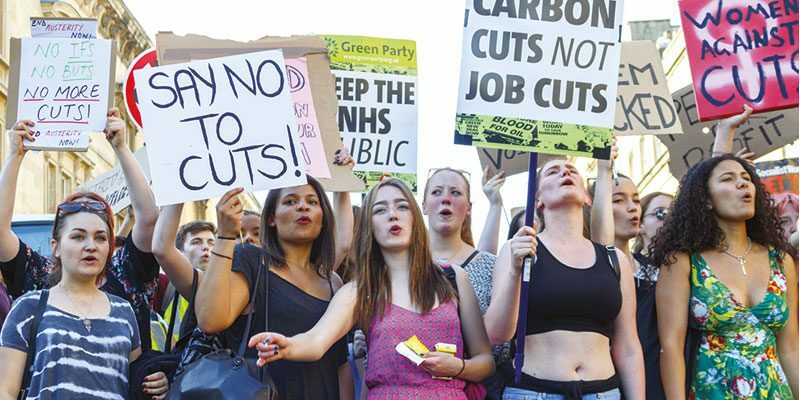 The leaders for such a movement are ones like the Bristol young women who got people on the streets in their thousands before would-be Labour leaders had said a word of protest against the new government.